The old craftsman’s adage preaches, “Use the right tool for the job.” But every artisan knows how to improvise in a pinch and often discovers in the bargain that the right tool is usually one’s brain. So, what if we used Stock Checkup, a premium feature at Investors.com, in order to spot-check the quality of a stock’s base? At the very least, it can get you off to a smart start. 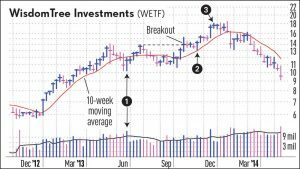 XAutoplay: On | Off Let’s study the ETF asset management service company WisdomTree Investments (WETF) during its action in the spring and summer of 2013. At the time, the stock was carving higher in the 10th week of a V-shaped cup base. The base showed a reasonable correction that was 28% deep, and the stock had been climbing the right side for the past four weeks. That base ultimately failed, but a longer, stronger new cup base emerged and this one ultimately led to a profitable breakout.